Does My Dentist Near Me Know Home Remedies? It’s a relaxed Saturday night and you’re happily planted on your couch, streaming your favorite shows. You’re drinking a cool beverage and mindlessly chewing the ice when you feel a sudden crack. Something definitely feels off in your mouth. Your run your tongue over your teeth and realize one of them has split in half. You start to panic. You go to check yourself in the mirror and a piece of your tooth falls into your mouth. Now you’re looking at it in your hand as the pain starts to seep in. It’s late on a Saturday night and there’s no way you can get to the dentist until Monday. 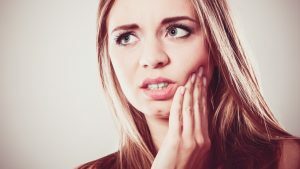 You ask yourself, “What does my dentist near me think I should do?” Dr. Mark Gray knows a few home remedies you can use to help ease your dental pain before you come see him. Clove oil has been used for generations to help treat dental pain. It contains eugenol, which is a natural anesthetic which also has antibacterial properties. Soak a cotton-ball with a combination of clove and olive oil and place it where you are feeling pain for a quick fix. This isn’t a permanent solution, however, and you should still come see Dr. Gray as soon as you can to help fix your problem. Cough drops and lozenges usually contain a small amount of menthol or benzocaine, which are both anesthetics. Simply pop one in your mouth (don’t chew!) and place it where you are feeling pain. This common treatment for congestion can also help take the edge off of your dental pain. Dab a bit on the outside of your cheek where your tooth is hurting, place a paper towel on your pillow, and sleep on that side. This will help numb the area and help you sleep. A warm compress such as a hot tea bag can help partially relieve your dental pain. It contains tannic acid, which has been shown to naturally reduce swelling. Anyone who has experience with alcohol knows that it can have numbing properties. A cotton-ball soaked in brandy, bourbon, or whiskey can help take away some of the pain. Another home remedy is to gently rinse your mouth with warm salt water. This can help in two ways. One, the warmth of the water can help ease your dental pain. Two, the salt water rinses your mouth out and helps stimulate it to fight infection. Often times, the most dangerous part of a broken tooth is the chance of infection leading to other complications. Of course, these are all temporary solutions. What you really need to do is see your emergency dentist in 77077, Dr. Mark Gray, as soon as possible. He’ll be able to effectively treat the underlying cause of your pain, whether it be a broken tooth or anything else. This is the only way to ensure that your teeth will be properly repaired. Dr. Gray will always try to see you as soon as possible whenever you find yourself in a large amount of dental pain. These home remedies will only help you be more comfortable until you can see him. Don’t wait to call when you find yourself in pain. If you would like to know more about what you can do at home to help keep your teeth healthy and pain free, please give us a call today. Comments Off on Does My Dentist Near Me Know Home Remedies?